If you follow this site, you know I’m a fan of Johnny Marr. In my humble opinion, he’s one of the greatest guitarists out there, and simply a fantastic song write as well. His sense of melody and how he combines single note melodies within chordal groupings, is pretty mind blowing. If you start to break apart old Smiths songs, you’ll see what I’m talking about. The guy is brilliant. Back in 2015, I had a chance to see his band perform live, and there was no way I was going to miss this performance. To see his guitar work up close and personal (I was basically front and center at the show), it was inspiring. I’ve also been a fan of his Fender signature guitar as well. I’ve been playing the Fender Marr Jag in Olympic White for about 5 years, and a couple of years ago, I picked up the Black model. I’ve played a few Jaguars, and the Marr is by far the best designed Jag out there. With the 4 way switch (instead of the accordion switches), hi pass switches instead of the rhythm/lead circuit, better bridge (though I still upgraded to Mastery) and awesome stay-trem system. Love it. Yesterday, I saw a great interview with Marr – which goes into his technique a little, but most importantly, how some of these songs come about and his strategy on pulling melodies out. 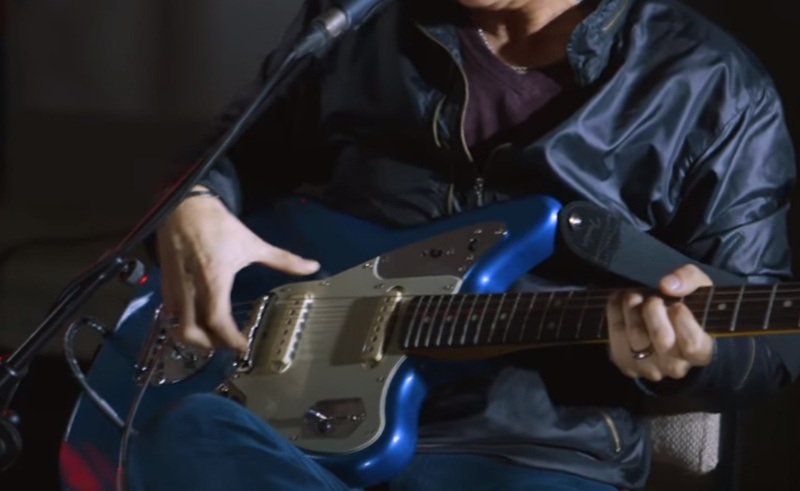 But on top of that.. he’s playing a Lake Placid Blue Marr Jaguar. Lord help me from buying it when it comes out. do we know what amps and effects he used on this talk? Kinda a bit too wet for Marr but sounded darn close actually, dry that up a bit and bam. Would like to know what he was using besides the sig obviously. Yes, that Jag is perfect. I also installed the mastery bridge on both of my jags, primary to make sure that the high E string didn’t rest on the bottom edge of the fretboard, and to further stabilize intonation. The mastery bridge better aligns that string and makes sure this guitar is always in tune. In fact, I can play for three or four days, with or without capos, and the guitars are always in tune. It is easily the best guitar I’ve ever played. In anser to Paul’s question, Johnny uses a GT100 live (he just presses one of the two latching switches next to his stage microphone to change effects, often during the same song). In studio, and I think during this Fender session, he uses various Carl Martin pedals, including the Delayla XL, chorus, plexitone, compressor, etc.